Lay out pizza crusts on baking sheet pans. Top each crust with 11 oz. shredded turkey, 8 oz. shredded mozzarella, ½ c. bacon bits, and ¼ c. red onion. 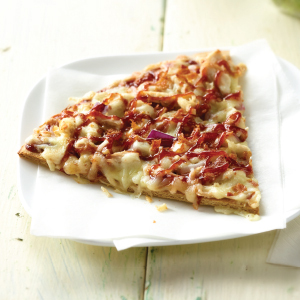 Drizzle ½ c. BBQ sauce over each pizza. Bake pizzas at 425° F for 10-12 minutes until cheese is melted and lightly browned. Cut each pizza into 8 slices and serve. 1 serving provides 2 oz. meat/meat alternate and 2 oz. serving bread/grain. Whole grain pizza crust, 16", prebaked 6 ea. 12 ea. JENNIE-O® Shredded Turkey Breast, #220120, thawed 4 lbs. 2 oz. 8 lbs. 4 oz. JENNIE-O® Premium Turkey Bacon Bits, #871602, thawed 10 oz. 1 lb. 4 oz. Mozzarella, LMPS, shredded 3 lbs. 6 lbs. Red onions, diced 1½ c. 3 c.
BBQ sauce, prepared 3 c. 1 qt. 2 c.